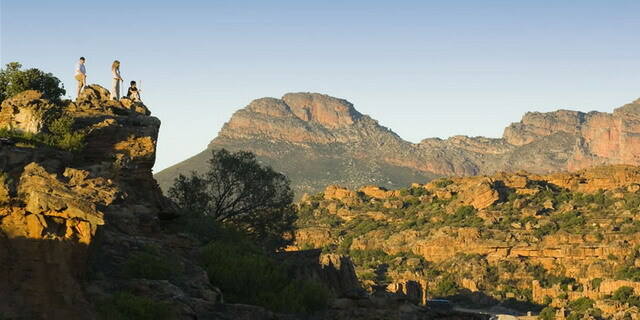 Approximately 165 miles north of Cape Town, on the edge of the vast Cederberg Wilderness Area, lies Bushman's Kloof. 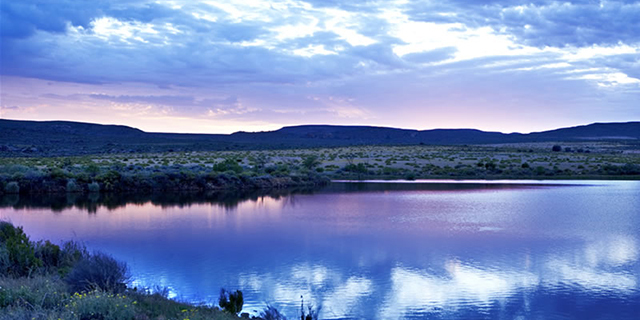 This 17,000 acre private reserve forms an oasis between the rugged foothills of the Cederberg Mountains and the ancient plains of the Great Karoo. The area, which has a unique surface and subterranean river system, is characterized by immense open plains, ravines, waterfalls, and towering rock formations, and is home to an impressive diversity of wildlife and botanical communities. The reserve also hosts the world's largest private open-air art gallery - over 130 rock art sites in pristine condition have been discovered on the property, some dating back as far as 10,000 years. The abundance of water and natural caves, and the wealth of plant and animal life in the craggy Cederberg Mountains made this area perfect for the San Bushmen - hunter-gatherers who dwelled in peaceful co-existence with the southern African wilderness for thousands of years before the arrival of Bantu and later European peoples. While the San have all but disappeared, they have left us with one of the most priceless cultural treasures on earth, in the form of their hauntingly beautiful rock art. There are few places where better examples of this rock art are to be found than on the Bushman's Kloof reserve. The reserve is also home to a broad variety of interesting and often endemic species of African game animals, many of which do not occur in South Africa's other high profile parks and reserves. Some of the rare and unique species found at Bushman's Kloof include Cape Mountain Zebra, Bontebok, Black Wildebeest, Eland, Gemsbok, Cape Mountain Leopard, Springbuck, and Cape Clawless Otter. There are also more than 150 resident bird species. An additional highlight of Bushman's Kloof is its botanical wealth. The reserve lies between two biomes - dry mountain Fynbos and succulent Karoo, providing for incredible floral diversity, with over 755 different species of plants having been identified to date. In Spring (July through September), the reserve explodes into a kaleidoscope of color as the northern Cape's famous desert flowers come into bloom, creating a blanket of color as far as the eye can see. To experience the essence of this magical wilderness area, guests are invited to participate in a wide variety of activities. Nature drives (day and night) in open Landrovers, accompanied by a knowledgeable guide, enable guests to view a variety of wildlife, and enjoy the ever-changing vistas and vegetation. 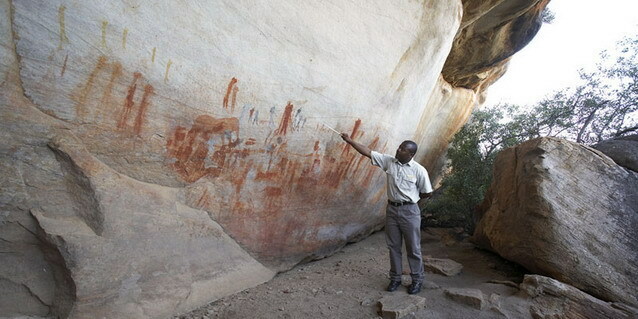 Expertly guided rock art tours provide visitors with an insight into the ancient and mysterious culture of the San Bushmen. For the more energetic, the reserve offers hiking, mountain biking, rock climbing, canoeing, and fly-fishing. The lodge's Heritage Center is a veritable museum of San Bushman artefacts, and is an ideal setting for specialist talks and discussions about the reserve's rock art, fauna, and flora. The Relais & Chateau Bushman's Kloof Lodge is situated in the heart of the reserve, on the banks of a babbling river. Guests are accommodated in seven luxury and seven deluxe rooms set among landscaped gardens and pools, or within the original Manor House (circa 1843). The accommodations are spacious, luxuriously appointed, and tastefully decorated in neutral hues. There are two gracious and exclusive suites on the property. The heart of Bushman's Kloof is the Homestead, which welcomes guests to the convivial bar, a wine cellar, well-stocked library, the acclaimed restaurant and a dining terrace. A highlight of the lodge grounds is the infinity edge swimming pool set at the edge of the garden overlooking the river and its rocky banks. Dining is a gourmet affair at Bushman's Kloof, with a creative and complementary menu that fuses country cooking with gourmet flair. Only the finest and freshest ingredients are chosen, most of which are procured from the lodge's organic garden, to produce a delicious melange of taste, aromas and textures. The Spa is similarly inspired by the gifts of the Cederberg landscape. Treatments can be enjoyed in a conventional spa setting, cantilevered over the river in an outdoor spa gazebo, or in a secluded rock shelter overlooking the tranquil valley. Featured products include preparations from ancient healing plants used by the Bushmen for millennia. Bushman's Kloof is an holistic retreat in the remote and harsh wilderness of South Africa's vast Northern Cape Province. It offers a feast of activities and attractions, along with the beauty and tranquility unique to such an ancient and undisturbed hideaway. A visit to Bushman's Kloof is a spiritual and invigorating experience, and one that we would highly recommend to any visitor interested in delving into South Africa's treasures. Following nearly 150 years of indiscriminate hunting and wasteful farming methods, an ambitious project was initiated in the Cederberg Mountains in 1992 to recreate the scenic and bountiful wilderness that had existed during the time of the San Bushmen. The outcome is Bushman's Kloof, one of Southern Africa's greatest success stories in private conservation. In recognition of its immense cultural, historical, and environmental achievements and significance, Bushman's Kloof has been declared a South African National Heritage Site. It is also a key component within the Cape Floral Region, a UNESCO World Heritage Site. 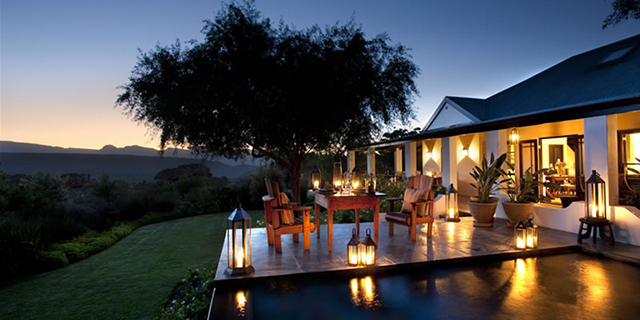 Bushmans Kloof Wilderness Reserve is a Luxury Eco Lodge Located in South Africa's Cederberg Mountains.